Definition at line 103 of file lltexturectrl.cpp. Definition at line 189 of file lltexturectrl.cpp. References LLUICtrlFactory::buildFloater(), LLPanel::childSetAction(), LLPanel::childSetCommitCallback(), LLPanel::childSetEnabled(), LLPanel::childSetValue(), LLPanel::childSetVisible(), FALSE, findItemID(), LLControlGroup::getBOOL(), LLPanel::getCtrlByNameAndType(), LLFolderView::getFilter(), LLInventoryPanel::getRootFolder(), LLUICtrlFactory::getTextBoxByName(), gSavedSettings, gUICtrlFactory, LLInventoryType::IT_SNAPSHOT, LLInventoryType::IT_TEXTURE, LLInventoryFilter::markDefault(), mCanApplyImmediately, mImageAssetID, mInventoryPanel, mNoCopyTextureSelected, mResolutionLabel, mSavedFolderState, mSearchEdit, mTentativeLabel, onApplyImmediateCheck(), onBtnCancel(), onBtnNone(), onBtnPipette(), onBtnSelect(), onBtnSetToDefault(), onBtnWhite(), onSearchEdit(), onSelectionChange(), onShowFolders(), LLInventoryPanel::setAllowMultiSelect(), LLSaveFolderState::setApply(), LLFloater::setCanMinimize(), LLInventoryPanel::setFilterPermMask(), LLInventoryPanel::setFilterTypes(), LLSearchEditor::setSearchCallback(), LLInventoryPanel::setSelectCallback(), LLInventoryPanel::setSelection(), LLInventoryPanel::setShowFolderState(), LLInventoryFilter::SHOW_NON_EMPTY_FOLDERS, TAKE_FOCUS_NO, updateFilterPermMask(), WIDGET_TYPE_INVENTORY_PANEL, and WIDGET_TYPE_SEARCH_EDITOR. Definition at line 283 of file lltexturectrl.cpp. Definition at line 669 of file lltexturectrl.cpp. References LLSD::asBoolean(), LLPanel::childGetValue(), mNoCopyTextureSelected, mOwner, LLTextureCtrl::onFloaterCommit(), and LLTextureCtrl::TEXTURE_CHANGE. Referenced by handleDragAndDrop(), handleKeyHere(), and onApplyImmediateCheck(). Definition at line 480 of file lltexturectrl.cpp. References LLColor4::black, LLViewerImage::BOOST_PREVIEW, border, BORDER_PAD, LLFocusMgr::childHasKeyboardFocus(), LLFocusMgr::childHasMouseCapture(), LLPanel::childSetEnabled(), LLPanel::childSetValue(), CONTEXT_CONE_IN_ALPHA, CONTEXT_CONE_OUT_ALPHA, CONTEXT_FADE_TIME, LLFloater::draw(), LLView::drawChild(), f, FALSE, FOOTER_HEIGHT, LLTextureCtrl::getAllowNoTexture(), LLToolMgr::getCurrentTool(), LLTextureCtrl::getDefaultImageAssetID(), LLControlGroup::getF32(), LLInventoryPanel::getFilterSubString(), LLRectBase< Type >::getHeight(), LLViewerImageList::getImage(), LLCriticalDamp::getInterpolant(), LLView::getLocalRect(), LLUICtrl::getTentative(), LLView::getVisible(), LLRectBase< Type >::getWidth(), gFocusMgr, gImageList, gl_draw_scaled_image(), gl_draw_x(), gl_rect_2d(), gl_rect_2d_checkerboard(), glBegin, glColor4f, glEnd, LLColor4::grey, gSavedSettings, gToolMgr, gToolPipette, HPAD, IMMEDIATE_NO, LLView::isInVisibleChain(), LLFloater::isMinimized(), LLUUID::isNull(), lerp(), LLFLOATER_HEADER_SIZE, LLView::localRectToOtherView(), mActive, LLRectBase< Type >::mBottom, mCanApplyImmediately, mContextConeOpacity, LLFloater::mDragHandle, mImageAssetID, mInventoryPanel, MIPMAP_YES, mIsDirty, LLRectBase< Type >::mLeft, mNoCopyTextureSelected, mOwner, LLView::mRect, LLRectBase< Type >::mRight, mSearchEdit, mTentativeLabel, mTexturep, LLRectBase< Type >::mTop, mWhiteImageAssetID, LLUUID::notNull(), NULL, LLSearchEditor::setText(), LLView::setVisible(), LLRectBase< Type >::stretch(), TEX_PICKER_MIN_HEIGHT, TEX_PICKER_MIN_WIDTH, TEXTURE_INVENTORY_PADDING, TRUE, and updateImageStats(). Definition at line 626 of file lltexturectrl.cpp. Referenced by LLFloaterTexturePicker(), LLTextureCtrl::onFloaterCommit(), and setImageID(). Definition at line 130 of file lltexturectrl.cpp. Definition at line 663 of file lltexturectrl.cpp. References LLSD::asBoolean(), LLPanel::childGetValue(), mImmediateFilterPermMask, and mNonImmediateFilterPermMask. Definition at line 138 of file lltexturectrl.cpp. Definition at line 364 of file lltexturectrl.cpp. References ACCEPT_NO, ACCEPT_YES_SINGLE, LLPermissions::allowCopyBy(), LLPermissions::allowModifyBy(), LLPermissions::allowOperationBy(), commitIfImmediateSet(), DAD_TEXTURE, FALSE, gAgent, LLInventoryItem::getAssetUUID(), LLAgent::getID(), LLView::getName(), LLInventoryItem::getPermissions(), lldebugst, llendl, mImmediateFilterPermMask, PERM_COPY, PERM_MODIFY, PERM_TRANSFER, setImageID(), and TRUE. Definition at line 415 of file lltexturectrl.cpp. References commitIfImmediateSet(), FALSE, LLUICtrl::focusFirstItem(), gAgent, LLFolderView::getCurSelectedItem(), LLAgent::getInventoryRootID(), LLFolderView::getItemByID(), LLInventoryPanel::getRootFolder(), LLPanel::handleKeyHere(), LLUICtrl::hasFocus(), KEY_DOWN, KEY_RETURN, KEY_UP, MASK_NONE, mInventoryPanel, mSearchEdit, LLFolderView::scrollToShowSelection(), LLFolderView::setFocus(), LLFolderView::setSelection(), and TRUE. Definition at line 135 of file lltexturectrl.cpp. Definition at line 807 of file lltexturectrl.cpp. References commitIfImmediateSet(), LLCheckBoxCtrl::get(), gSavedSettings, LLControlGroup::setBOOL(), and updateFilterPermMask(). Definition at line 719 of file lltexturectrl.cpp. Definition at line 699 of file lltexturectrl.cpp. Definition at line 743 of file lltexturectrl.cpp. References LLToolMgr::clearTransientTool(), gToolMgr, gToolPipette, onTextureSelect(), LLToolPipette::setSelectCallback(), and LLToolMgr::setTransientTool(). Definition at line 732 of file lltexturectrl.cpp. Definition at line 679 of file lltexturectrl.cpp. Definition at line 690 of file lltexturectrl.cpp. Definition at line 454 of file lltexturectrl.cpp. References LLFloater::destroy(), mOwner, LLTextureCtrl::onFloaterClose(), and stopUsingPipette(). Definition at line 823 of file lltexturectrl.cpp. Definition at line 765 of file lltexturectrl.cpp. References LLPermissions::allowCopyBy(), FALSE, gAgent, LLInventoryItem::getAssetUUID(), LLAgent::getID(), LLInventoryModel::getItem(), LLInventoryItem::getPermissions(), gInventory, and TRUE. Definition at line 791 of file lltexturectrl.cpp. Definition at line 860 of file lltexturectrl.cpp. References LLPermissions::allowCopyBy(), FALSE, gAgent, LLAgent::getID(), LLTextureEntry::getID(), LLInventoryModel::getItem(), LLInventoryItem::getPermissions(), gInventory, gToolPipette, LLUUID::notNull(), LLToolPipette::setResult(), and TRUE. Definition at line 465 of file lltexturectrl.cpp. References LLPanel::childGetText(), mLabel, LLPanel::postBuild(), LLFloater::setTitle(), and TRUE. Definition at line 313 of file lltexturectrl.cpp. References LLPanel::childGetValue(), mActive, and stopUsingPipette(). Referenced by LLTextureCtrl::setEnabled(), and LLTextureCtrl::setValid(). Definition at line 322 of file lltexturectrl.cpp. References LLPanel::childSetValue(), FALSE, mCanApplyImmediately, and updateFilterPermMask(). Definition at line 134 of file lltexturectrl.cpp. Definition at line 287 of file lltexturectrl.cpp. References LLPermissions::allowCopyBy(), LLPanel::childSetValue(), LLInventoryPanel::clearSelection(), FALSE, findItemID(), gAgent, LLAgent::getID(), LLInventoryModel::getItem(), LLInventoryItem::getPermissions(), gInventory, LLUUID::isNull(), mActive, mImageAssetID, mInventoryPanel, mIsDirty, mNoCopyTextureSelected, LLInventoryPanel::setSelection(), TAKE_FOCUS_NO, and TRUE. 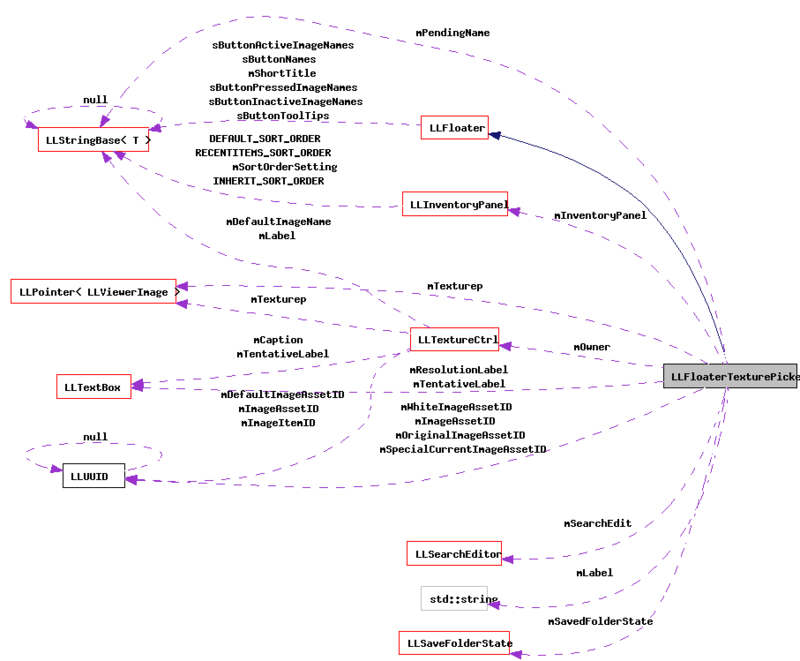 Referenced by handleDragAndDrop(), and LLTextureCtrl::setImageAssetID(). Definition at line 139 of file lltexturectrl.cpp. Referenced by LLTextureCtrl::closeFloater(), and LLTextureCtrl::onFloaterClose(). Definition at line 332 of file lltexturectrl.cpp. Referenced by onClose(), and setActive(). Definition at line 818 of file lltexturectrl.cpp. Referenced by LLFloaterTexturePicker(), onApplyImmediateCheck(), and setCanApplyImmediately(). Definition at line 340 of file lltexturectrl.cpp. References gAgent, LLAgent::isGodlike(), llformat(), mResolutionLabel, mTexturep, LLPointer< Type >::notNull(), LLTextBox::setTextArg(), and LLFloater::setTitle(). Definition at line 177 of file lltexturectrl.cpp. Referenced by draw(), setActive(), and setImageID(). Definition at line 183 of file lltexturectrl.cpp. Referenced by draw(), LLFloaterTexturePicker(), and setCanApplyImmediately(). Definition at line 185 of file lltexturectrl.cpp. Definition at line 164 of file lltexturectrl.cpp. Referenced by draw(), getAssetID(), LLFloaterTexturePicker(), and setImageID(). Definition at line 181 of file lltexturectrl.cpp. Referenced by getFilterPermMask(), and handleDragAndDrop(). Definition at line 180 of file lltexturectrl.cpp. Referenced by draw(), handleKeyHere(), LLFloaterTexturePicker(), onSearchEdit(), onShowFolders(), and setImageID(). Definition at line 176 of file lltexturectrl.cpp. Referenced by draw(), isDirty(), setDirty(), and setImageID(). Definition at line 170 of file lltexturectrl.cpp. Definition at line 184 of file lltexturectrl.cpp. Referenced by commitIfImmediateSet(), draw(), LLFloaterTexturePicker(), and setImageID(). Definition at line 182 of file lltexturectrl.cpp. Definition at line 168 of file lltexturectrl.cpp. Definition at line 162 of file lltexturectrl.cpp. 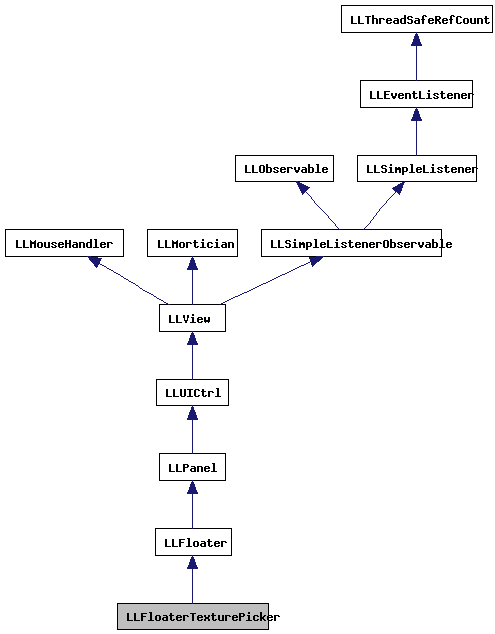 Referenced by commitIfImmediateSet(), draw(), getOwner(), onClose(), and setOwner(). Definition at line 175 of file lltexturectrl.cpp. Definition at line 173 of file lltexturectrl.cpp. Referenced by LLFloaterTexturePicker(), and updateImageStats(). Definition at line 186 of file lltexturectrl.cpp. Referenced by LLFloaterTexturePicker(), and onSearchEdit(). Definition at line 179 of file lltexturectrl.cpp. Referenced by draw(), handleKeyHere(), and LLFloaterTexturePicker(). Definition at line 167 of file lltexturectrl.cpp. Definition at line 172 of file lltexturectrl.cpp. Referenced by draw(), and LLFloaterTexturePicker(). Definition at line 161 of file lltexturectrl.cpp. Referenced by draw(), and updateImageStats(). Definition at line 166 of file lltexturectrl.cpp.